The art of turning stone into gold is known as Alchemy. Anish Kapoor has been tagged by his entourage as an alchemist, turning chunks of granite into metaphorical caves, their apparent hollow blue centres echoing with the dark secrets of the psyche. Akin to a pastor, he spreads piles of scarlet, yellow, blue pigment on the wall or floor, through which massive cement abstractions thrust into the room like vivid deities, his works resonate his own strange juxtapositions. Being one of the most influential sculptors of his generation, perhaps largely acknowledged for public sculptures that are both escapades in form and feats of engineering, he maneuvers between vastly varied scales, across numerous series of work. Immense PVC skins, stretched or shrunk; concave or convex mirrors whose reflections lure and engulf the viewer; recesses engraved in stone and pigmented so as to disappear: these voids and projections gather deep-felt metaphysical polarities of presence and absence, hiding and revelation. Forms turn themselves inside out and materials are not painted instead impregnated with colour, with the hope of negating the idea of an outer surface, summoning the viewer to the inner reaches of the creativity. His geometric forms typically rise up from the floor and appear to be made out of pure pigment, while the viscous, yet kinetic and self-generating blood-red wax sculptures ravage their own surfaces and attempt to explode the quiet of the gallery environment. For Anish’s creations, the viewers may not be the primacy but they certainly have their own special impact on the way his work ultimately shapes up. “I always felt very concerned with the viewer. I feel I don’t make work for somebody else, I make what I make for me. Yet I am very concerned with the viewer, in a sense that art is very good at intimacy and very good at a specific address. Most of my works demand that you look at them from a particular place. That seems to say that there is this very specific quite formal address. The work demands a certain kind of passage, but it does say something about the ritual of looking”, says the artist. His works show resonance with mythologies of the ancient world – Indian, Egyptian, Greek and Roman alike – and with modern times, where 20th century events loom out. He claims that the powerful spiritual and mythological reverberations of his sculptures arise from his frequent return visits to India. Natural materials such as sandstone, marble and slate are soaked with raw powdered pigment of jazzy hues, thereby enhancing the experiencing of inner radiance. His work is permeated by hermetic lyricism that bears qualities of both Western and Eastern culture. In the early 1990s he introduced, in his work, a more mysterious slant by boring holes in the flanks of standing stones. In one of his creations called “The Earth” (1992; installed San Diego, CA) the gallery floor was scooped out in the shape of a circle to intimate the generative effect of negative space. In some of his other works, impressions of weightlessness stem from the skilled transformation of materials by an almost alchemical process; earth slabs coated with brilliant blue pigment become signs for sky and water. By imaginative combination of disparate materials in meditative structures, attention is focused on qualities of interior balance and well-being. The work of Anish Kapoor has confounded the descriptions of writers, viewers and critics alike for decades because his forms are so elemental yet awe-inspiring. It does not come as a surprise that the artist appears to find his influence well outside the conventional norm of the times. Instead, citing influences as oblique as the spice markets of his native India and his work reads more as a Jungian bestiary of symbols dredged up under the influence of psychotropic. Upon the appearance of his first works in the popular ‘niche media’ of the time, it was quite evident that it looked like nothing that had been done in recent memory. At the time, he cited the Mumbai spice markets as his inspirations for this particular exploration of the use of colour. In 2006, he installed Sky Mirror at Rockefeller Center, a 23-ton, three-story high stainless steel sculpture that impeccably reflected the New York skyline. He described the massive work as a “non-object” saying that its reflective surface allowed it to disappear into thin air. “I don’t wish to make sculpture about form, it doesn’t really interest me. I wish to make sculpture about belief or about passion or about experience”, says Anish. 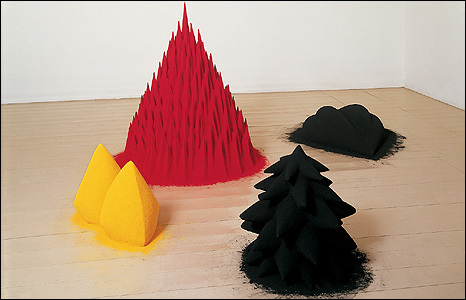 Anish Kapoor isn’t just a sculptor, he’s a force of nature which turns everything it touches into mystical works of art. People like him continue to inspire us.